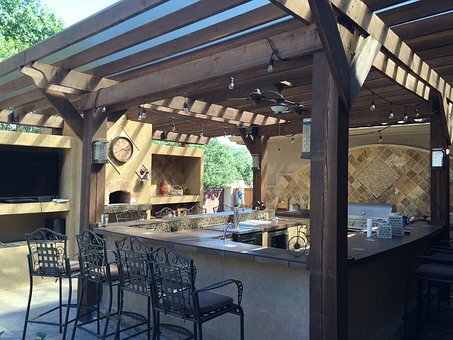 Outdoor Kitchen : Having one is a must for a real Barbecue experience. Alongside transferring the heat outdoors, an outdoor kitchen brings a form of unity and excitement that’s absent indoors. Just imagine throwing a summer party for your loved ones while cooking, grilling and enjoying the serenity instead of sweating away alone in the kitchen. Are you torn between building an outdoor kitchen and using the typical indoor kitchen this summer ? I’ll tell you why having an outdoor kitchen is a must. What is a Patio Kitchen? While they are often regarded as signs of luxury, outdoor kitchens are pretty rare in the US. It bears a sharp contrast to the Mediterranean region where cooking outdoors is a norm. However, owing to the splendor and grandeur associated with having a BBQ pit outdoors, having a patio kitchen nowadays is proving to be a popular trend across the United States. 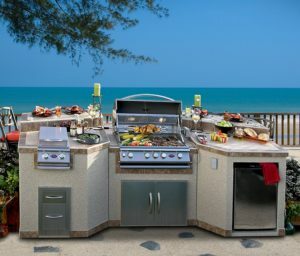 An outdoor kitchen is a small, simple backyard kitchen designed with an outdoor range and a countertop for food preparation, including grilling and temporary storage of food. A modern patio kitchen can be made with a barbecue grill, a stovetop, refrigerator, cupboards and several comfy seats and sofas. However, it can be simple with a cooking area and a storage space. What’s the essence of having an outdoor kitchen? It is indeed true that having an outdoor kitchen during summer is an incredible idea. Creating one requires no huge budget and can be ready in a day or two. Again, as an essential element of luxury at no cost, a kitchen that’s different from the ordinary also enhances the curb appeal of a natural home. That’s probably the main reason why savvy homeowners are moving towards creating a simple backyard home. 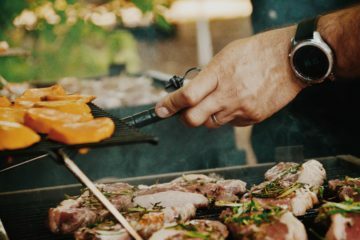 Grilling outside the confines of your house is a worthy idea, mainly because it creates an ample environment to barbecue foods without filling the home with smoke. As well as cooking for a large party, an outside kitchen comes in handy in preparing as many different dishes as possible. An indoor kitchen mostly allows cooking for a few people too. Again, it makes it possible to cook delicious meals whenever one needs to, especially when it is a relatively huge kitchen complete with all cooking assortment. You will worry about hiring a chef when you have a kitchen outside the house. All you will need is a recipe and your own culinary skills. 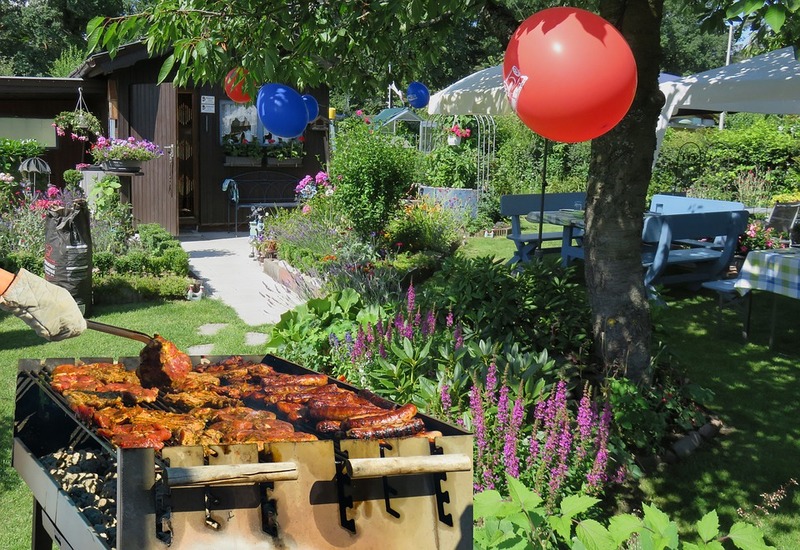 When was the last time you had a great barbecue party in your backyard ? More likely than not, you had a great time serving delicious grilled chicken and other foods. Now, More likely than not, you had a great time serving delicious grilled chicken and other foods. Now, you can bring back the nostalgic moments by building an outdoor kitchen. Just visualize how momentous it would be when a steak is grilled out on the patio as your guests socialize and dance the evening away. When you have a patio kitchen, your entertaining capacity suddenly becomes limitless. 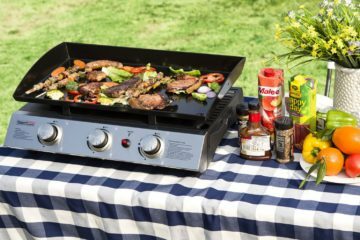 The roomy outdoor makes it easy to try grilling different favorite foods while allowing people to mingle and make fun. In fact, summer makes it perfect to take advantage of every corner of an outdoor kitchen. There’s no need to expand your kitchen or build an extra room when you can just erect a kitchen outdoors. Just create a simple kitchen, add a barbecue grill, a few more essentials including some pieces of furniture and your whole family will never have problems looking for a spot to relax outside. The same kitchen may come in handy during the cold season when you need to grill some steak, and the weather outside can’t allow. There’s something indescribable about enjoying grilled meat and other delicacies outdoors, especially during warm summer. It is a place where tasty foods are prepared, parties are held, and lifelong memories are made. With the pleasant temperatures, the foods in plenty and the roomy outdoors and lots of fun associated, having a patio kitchen is a plus. In fact, an outdoor pantry does come in handy when hosting special days such as birthday parties and holidays. Even when you don’t have a large family party to cook for, a kitchen outside offer a perfect excuse to relax outdoors, reminiscence the good old days and enjoy a tasty dish with your loved one. Especially when you have no reason to go for a romantic dinner, a barbecue will indeed serve as a better, thrifty alternative. Every time you dine at home rather than spending the cash at the restaurant, you keep the money for a better use. Home improvement is the best way of increasing the value of a house before it is sold. Properties that have an outdoor kitchen often fetch a significantly larger amount of money, compared with that which doesn’t have one. In fact, a house with a kitchen outside and a BBQ grill sell much faster because it is an extra amenity amongst ardent lovers of grilled foods. Perhaps, the most financially sensible reason of having a kitchen outdoors during the hot summer season, a patio kitchen will mean that you slash on your utility bills. First of all, your power bills will reduce because being outside cooking means that your air conditioner will have no job. Again, you may decide to use a cheaper grilling alternative in the name of the charcoal grill instead of the electric grill and propane BBQ. 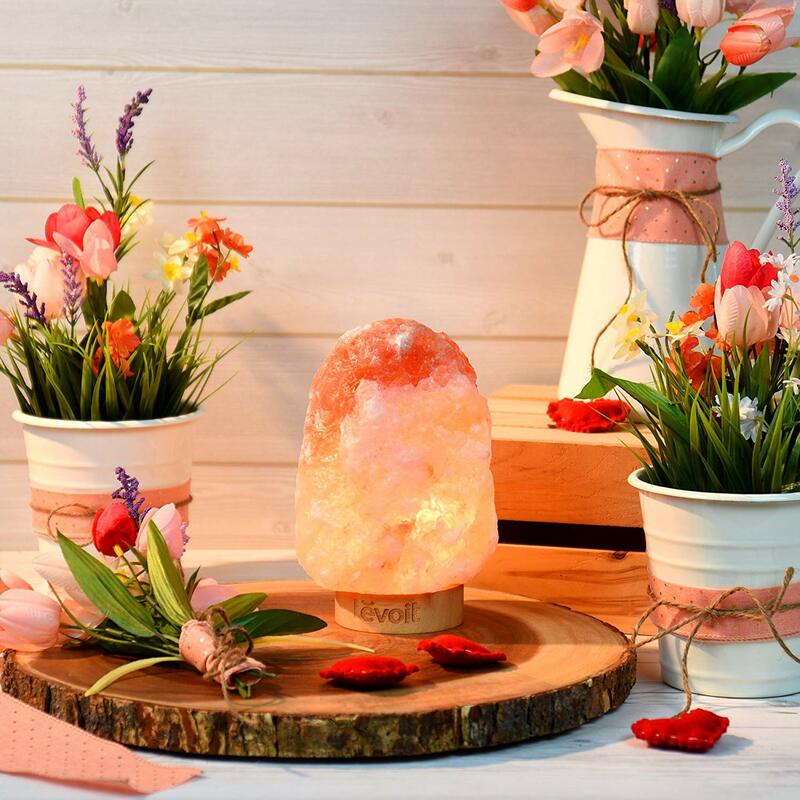 In the end, you will have invested in a notable way of saving on utility bills. Besides enhancing the value of your house, an outdoor kitchen often serves as a better way of giving the house a contemporary landscaping addition. You can include a stovetop-style burner, a few more griddles, and sinks, counters, refrigerators and storage spaces. 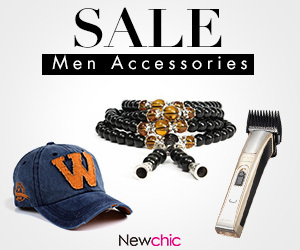 Even with a limited budget, you can have a sizeable number of design options to choose from. You may have a design that suits your style and personality and still enjoy the glamor of having a cheaper, better outdoor grilling alternative. Cleanup after a wild party becomes incredibly easy when cooking was done outdoors. All cabinets indoors stay in their pristine condition, and no smoke will taint the interior walls. If the kitchen outside has a sink and a countertop, cleaning all utensils will be easier too. 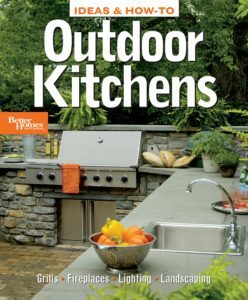 Need to build an Outdoor Kitchen? Now that you have all these reasons to include patio kitchen to your home, here are a few important tips to get started. Ideas & How-To: Outdoor Kitchens. 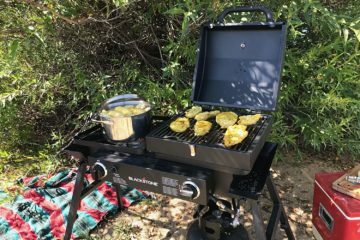 Either a Built-in or Portable Grill – as you decide on how big or small the barbecue grill to buy is, make sure that you factor in the mobility of the cooking equipment. For the financially stable, having both is a smart move. Countertop – as much as you will require a countertop space, plan accordingly so that it doesn’t take up a huge space of the entire outdoor kitchen. But don’t forget to make a countertop that can withstand harsh weather conditions. Flooring – perhaps, you would fancy a permanent structure. So, concrete, natural stone, brick, and tile or hardwood timber flooring options should be considered. However, it should be better to a floor that requires little or no maintenance. Lighting – an outdoor kitchen requires to be well light if it is to be used in the evening too. No griller will prepare delicious foods, chop and slice and serve food in the dark. However, lighting can be enhanced if it is given some glamor. Sink – for extra convenience, especially when cleaning the utensils, make sure that the patio kitchen is designed with a sink and running tap water. Just because you are thinking of building a Barbecue grill outdoors doesn’t mean that you cannot personalize it a bit. A kitchen outdoors is indeed a must-have if you are to actually grill sumptuous steak and experience summer serenity at your backyard every evening. With these and many other reasons, at least your home will be more than a house. In the future when you will be thinking of auctioning off the apartment, you will just point at the patio kitchen.